What did you say about my nun? 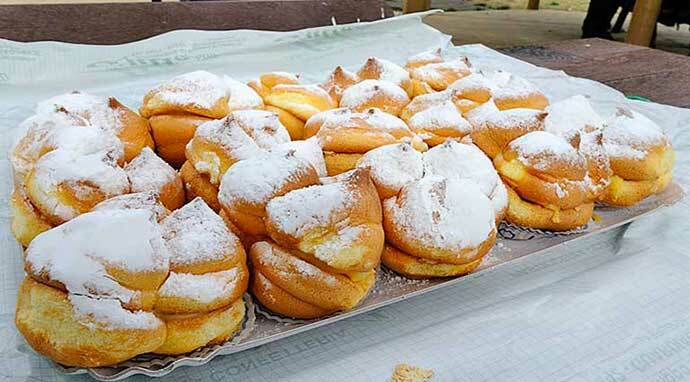 In Guardiagrele a dessert was created that became perhaps the most sacred in the land of the Italian peninsula- The sise di monaca; a three-humped soft sponge filled with custard and dusted with icing sugar. Professor Mario Palmerio penned an entire study dedicated to this intriguing little Italian cake. Remaining unchanged by time and originating in the foothills of the Maiella, the cake has won several important awards, including the inclusion in the list of quality local products prepared by the Ministry of Agriculture and Forestry. The name would likely bring some controversy in the US as it means “the breasts of nuns”, and you will know why this name was chosen when you see the sweet treat.